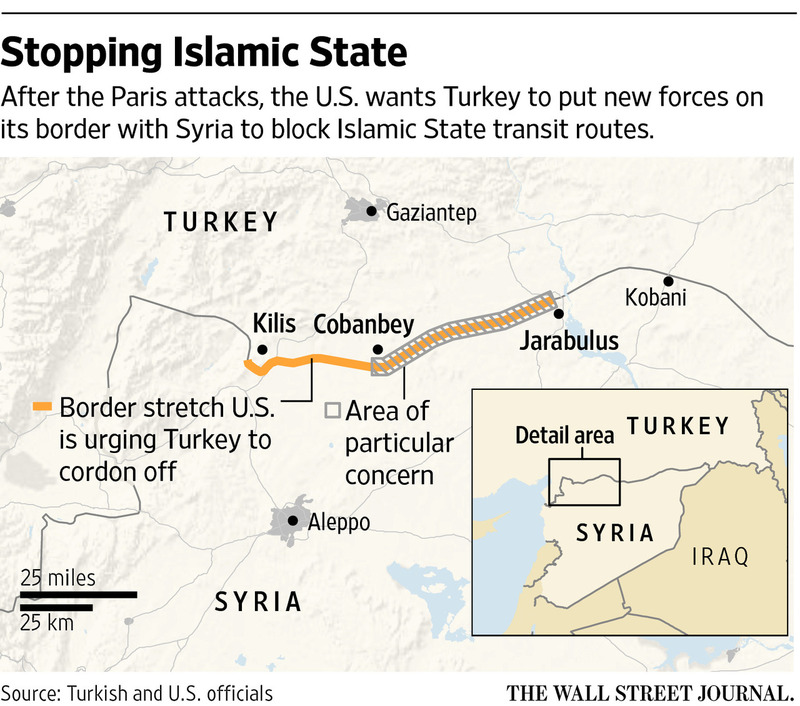 US-Turkey Edging Up to Syrian Border. Pretext to Invade, Establish ISIS “Safe Haven” in Northern Syria? US demands Turkey to “seal” notorious 100 km border region with Syria, but may be pretext to invade and establish long-sought after “safe haven” for terrorists in Syria. 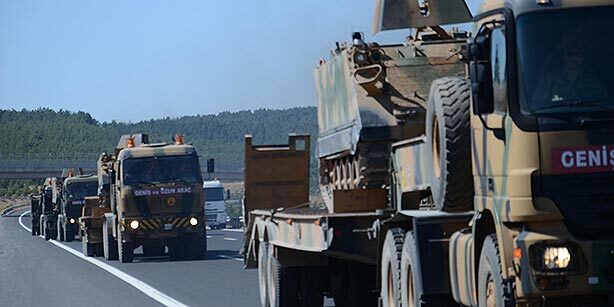 In the most open admission yet that NATO-member Turkey has been allowing a torrent of supplies, weapons, fighters, and equipment to flow across its borders with impunity and into the hands of the self-proclaimed “Islamic State” (ISIS), the US has urged Ankara to seal the remaining 100 km border region yet to be closed by Syrian and Kurdish forces. 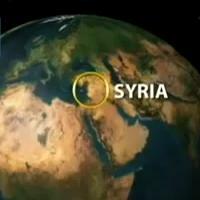 Coincidentally, the Wall Street Journal also reports that 30,000 troops are also precisely what is estimated to be needed to carve out a NATO-occupied “safe zone” within Syria, one US policymakers have plannedsince 2012 as a means of protecting Western-backed militants from Syrian – and now Russian – attacks. U.S. officials, including the Pentagon and the State Department, conducted an assessment this fall of how many troops it would take to create a safe zone, and concluded that it would take about 30,000 troops. Officials used that figure as a reference point to estimate the needs for a cordon, but said that could turn out to require fewer troops. Although some may find US calls for the border to be secured from the Turkish side welcomed, in reality, the summation of support for ISIS and other terrorist groups operating in Syria have long been crossing Turkey’s borders, with Ankara and Washington’s full knowledge and with Ankara and Washington having orchestrated the immense multi-year logistical operation themselves. 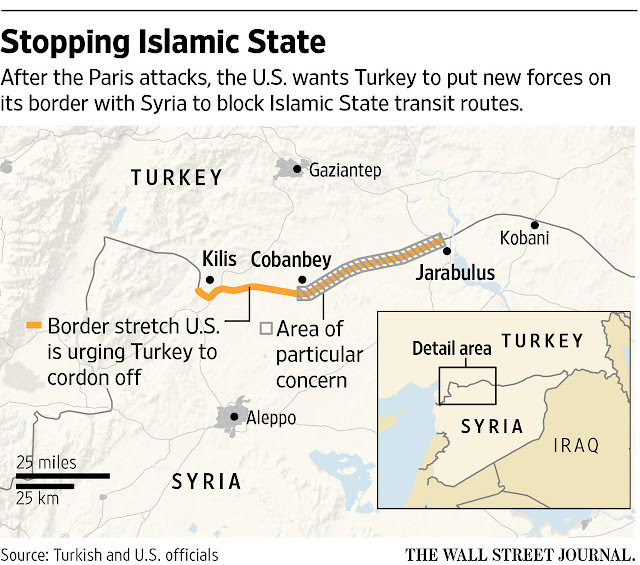 Image: The WSJ claims the US wants Turkey to stop ISIS transit routes. Transit routes from where to where? And is this finally an admission that the so-called “civil war” in Syria was really a NATO-sponsored invasion all along? Not only has it been revealed that the US State Department itself was running terrorists and weapons from as far as Croatia and Libya, through Turkey, and into northern Syria, it has been reported by prominent Western newspapers, including the New York Times that both US intelligence agents and US special forces have been operating along the very Turkish-Syrian border ISIS and other terrorist organizations have been moving weapons and fighters over since the conflict began in 2011. Increasing pressure from Washington on Ankara appears directly proportional not to America’s will to defeat ISIS, but the to the necessity of addressing growing public awareness that indeed, ISIS is being supported from beyond Syria’s borders by certain state sponsors and not from within Syria itself. That coincidentally the same number of troops needed to invade and occupy northern Syria have been called up to line the Turkish-Syria border to “secure it” is likely not a coincidence at all. In all likelihood, the West would like to attempt to make an incursion into Syria under the guise of having been provoked at the border, and then “needing” to cross over into Syria to pursue the provocateurs. The United States and Turkey, with their ambush of a Russian Su-24 over Syria, have proven just how far the West is willing to go to get an advantage, even superficially, over Russia, even if it means resorting to extreme treachery. Another “power move” wrung from this impending “border operation” seems all but inevitable. This increasingly desperate geostrategic posture comes at a time when Russia has begun bombing ISIS-bound convoys emerging from Turkish territory almost on the border itself. Syrian armed forces are likewise close to closing off this very border region from within their own territory. Syrian troops have approached the Euphrates River’s west bank and will begin moving north toward the Turkish border itself. Once this region is retaken by Russian-backed Syrian troops, there will be no “safe zone” for NATO to establish. To ensure that NATO’s plans are fully derailed along the Turkish-Syrian border, Russian-backed Syrian troops much ensure a substantial deterrence exists specifically to face this threat. Diplomatically, offers to establish a border guard or peacekeeping force on the Syrian side to compliment NATO’s within Turkish territory may be the best way to ensure NATO’s ambitions remain where they are. What the Wall Street Journal and the policy think-tanks it is repeating attempt to lay out is a narrative that claims in order to stop terrorists from passing through Turkish territory and into Syria, for some reason NATO needs to occupy Syria itself. Image: A Russian-led multinational peacekeeping force placed along the 100 km border region facing off NATO troops in Turkey would not only put a final end to the Syrian conflict, it would wrest control of the West’s self-proclaimed role as international arbiter over the world’s affairs. 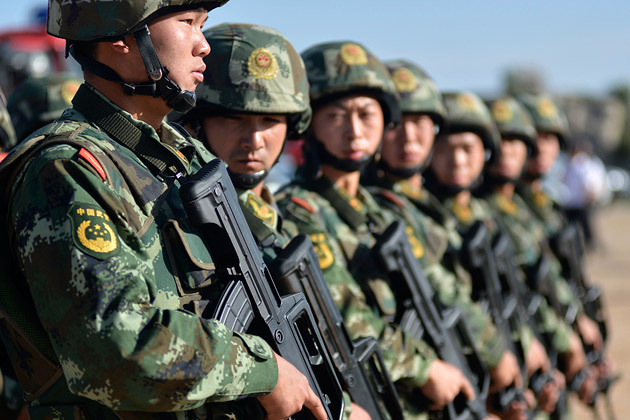 Those who join the peacekeeping force would form the new face of a multipolar world order set to displace Wall Street and London’s unipolar order. It is a narrative that defies reason and logic, and also fails to address the ports of entry terrorists, funds, and weapons are entering into Turkish territory from before heading onward to Syria – likely because those are ports – seaports and airports – controlled directly by NATO and Ankara itself. As the conflict appears to be drawing to a conclusion favorable to Syria and its allies, Damascus, Moscow, and Tehran must remain vigilant of the West’s designated “wild cards,” Turkey in the north, and Israel to the southwest. When tensions between NATO seem at their highest, what is more likely at play is a means of creating collective “plausible deniability” for NATO ahead of another act of war by one of its individual members or allies. For Moscow in particular, the downing of its Su-24 should be fair warning that while cooperation should continue to be sought as a matter of good diplomacy, treachery must be expected as a matter of good strategic planning.